Ever look at a nutrition facts label and have no clue what it means? Is trans fat going to kill you? Should you avoid saturated fat? Which is better: polyunsaturated fats and monounsaturated fats? It can be confusing, but I’ve got you covered. Get ready for a crash course on fats. There are four different types of fat: trans fat, saturated fat, monounsaturated fat (MUFA), and polyunsaturated fat (PUFA). The main factor that determines “good” vs. “bad” fats is their contribution to the development of cardio vascular disease (CVD). Cardiovascular disease can develop as a result of various things, but the most common is cholesterol build up in the arteries. The two main types of cholesterol carriers that influence cholesterol levels are HDL and LDL. HDL is usually called the “good” carriers that removes cholesterol from the body and brings it to the liver. LDL does the reverse; it takes cholesterol out of the liver and circulates it throughout the body where it can get trapped in the artery walls. When LDL cholesterol gets trapped in the artery walls, inflammation and hard plaques can develop. This inflammation makes it difficult for blood to move and plaques can break off and block arteries leading to a heart attack. How Do Fats Impact Cholesterol? 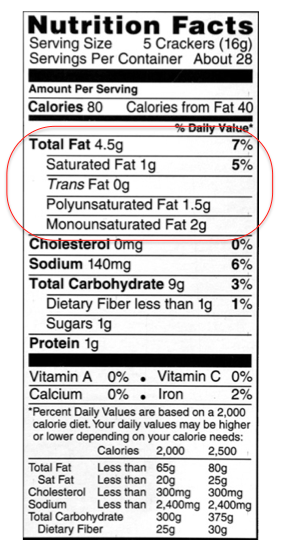 Trans Fat: Trans fat is the worst type of fat. When trans fats are consumed, your LDL levels increase and your HDL levels decrease. That means a huge increase in CVD risk. Compared to a person who eats absolutely no trans fat, a person who gets 2% of their calories from trans fat has at 23% greater risk of developing cardiovascular disease! Saturated Fat: Saturated Fats increase HDL and LDL cholesterol. That means they aren’t the best, but they aren’t nearly as bad as trans fats. Monounsaturated Fat: Monounsaturated fats have not been found to have a huge link to cardiovascular disease. Some studies have shown that they decrease risk, but most studies show that they do not impact CVD risk at all. Though, they do have some connection to increasing LDL particle size. This is a good thing because when LDL particles are bigger, it is less likely they will get trapped in the arteries. Polyunsaturated Fat: Polyunsaturated fats (PUFAs) come in two forms: omega-3 and omega-6. Omega-3 PUFAs have anti-inflammatory effects, can decrease LDL cholesterol, and increase LDL particle size- all good things. Omega-6 PUFAs, on the other hand, are pro-inflammatory and can cause blood vessels to narrow making it harder for blood to circulate. It gets complicated because both omega-3 and 6 are required for survival. Therefore, it is important to eat both, but omega-3 should be eaten in slightly larger quantities. So which ones should I eat?? Increase omega-3 polyunsaturated fat intake. These are going to have the greatest impact on cardiovascular disease risk. Just 250mg/day of fish high in omega 3 can decrease your CVD risk by 36%! Sources: flaxseed, salmon, and fresh tuna. Watch your omega-6 polyunsaturated fat intake. These are still an essential part of the diet and are needed for survival. In fact, they are required to prevent learning deficits, skin lesions, and impaired vision, but swapping some omega-6 for omeg-3 every now and then will decrease your risk of CVD. Sources: nuts/seeds, vegetable oils, and many processed foods. Don’t worry about monounsaturated fats. Keep eating these guys with no worries. It might be a good idea to swap saturated fats (like butter) for some MUFAs (like olive oil) when you are cooking. Sources: olive oil, avocados, and nuts/seeds. Consume saturated fat in moderation; a little bit won’t kill you. Sources: cheese, butter, whole milk, and red meats. Avoid trans fat at all costs. Keep trans fat consumption as low as possible (absolutely none is ideal) and chose any other type of fat before eating trans fat. Sources: fried food, margarine, non-dairy creamers, and processed cookies and crackers. Don’t forget, eating fat won’t necessarily make you fat. Fat is essential for the body to function so it is important to consume enough (20-35% of your calories should come from fat each day).